The question ‘Can dogs see colors?’ is that of great value. There were various theories regarding this with answers varying from yes to no and a maybe. Some presumed once that dogs could only differentiate between black and white; this used to be the common assumption, but recent studies show us entirely different evidence. Nowadays, scientists claim that dogs have the ability to distinguish between yellow and blue. Does that mean they can’t see other colors? What about the objects themselves, do they see a red ball? Who is to say…? This article will bring out and zoom into the wide spectrum of answers regarding these questions. It will answer them all in detail, each section thoroughly explained. At the end of this article, you will feel that you’ve covered everything you wished to know on the subject of dogs and colors. This question pops up quite a lot: Can dogs see colors or just black and white? The prevalent belief among veterinarians and the general public was many years that dogs are limited to only black-and-white vision, being, basically speaking, and color blind. That would mean that the answer to this paragraph’s inquiry would be ‘No, dogs can’t see colors‘. But as it turns out, this viewpoint has been revised due to recent studies which came to conclude that, although canine vision isn’t as rich as that of humans, it is still much more than merely a monochrome. As it emerges from the studies, dogs appear to possess a fifth of the humans’ color perception. Behavioral responses point out and lead us to conclude that dogs distinguish between yellow and blue while anything from green to red shows itself as gray. 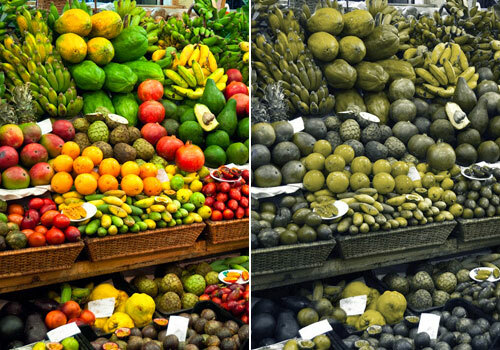 Martin Krzywinski, scientist at the Michael Smith Genome Sciences Centre, shows that when people experience color blindness, the condition shows itself in a lack of either red-green or yellow-blue color perception. 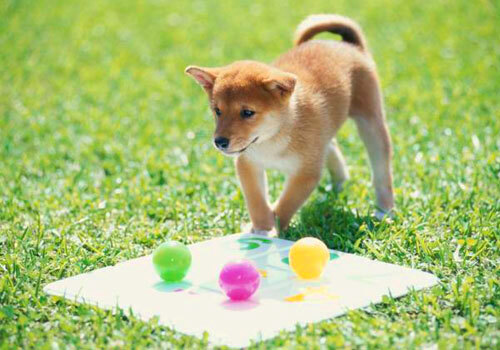 One could say that dogs experience color blindness of the red-green type. In addition, their perception of the gray scale, as well as brightness is lesser than in humans. We shouldn’t conclude from all this that dog’s color vision is not as good as that of humans. Lack of certain things is being compensated by nature by the abundance of others. Dogs are excellent, for example, in detecting motion in a distance, doing it up to 20 times better than people. That helps them to orientate better at night. And their sense of smell, of course, is so developed that it is easily like having an extra eye, one that can look into the past and also inside the body. Turning back to the question of the day ‘Can dogs see colors?‘ we can answer with certainty ‘yes, they can‘. To differ from humans, who have three color-sensitive cone cells, your canine companions have only two, so their vision is dichromatic. 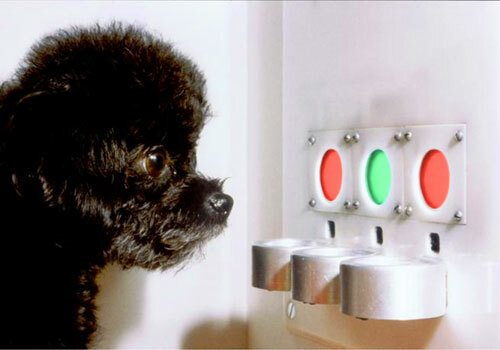 When faced with red or green objects your pooch will see them as being of the same color. However, they will be able to perceive the difference between the two based on their brightness. The decades old myth of dogs being able to see only black and white is being dispersed, and now it is a known fact that canines see colors. This finding is very helpful for us to understand our dogs better and is highly useful in their training and learning. Inside our eye, humans’ and dogs’, there are ‘cones‘; these are used to distinguish between colors. The human eye has three ‘cones’, whereas the canine one has two, thus deciphering less colors, a condition similar to that of color blind people. 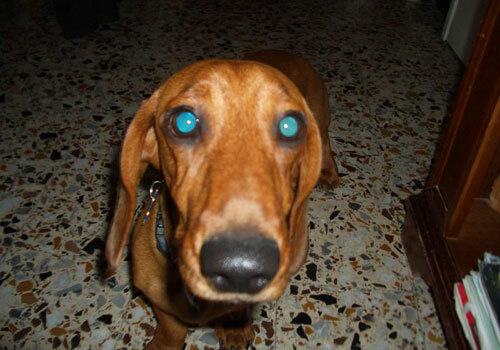 The color scale which dogs are capable of perceiving is as following: blue and yellow. It might sound like not much but, if to think about it, it really is quite a lot; each color has many shades, with only blue surpassing sixty. Same goes for yellow, starting with very light and all the way up to brown shades, dogs can see it all. As for the colors they can’t see – red and green – they can still see the differences in objects based on their brightness. So, it is not like if you throw your pooch a red ball on the grass, they will just walk by without ever taking notice of it. The answer to the question ‘What colors can dogs see‘ is: blue, yellow and gray, while red and green on all of their variations will appear as shades of blue, yellow and gray. If you play with your pup on the grass and throw a ball, both the grass and the ball might appear to them as yellow, but they will be able to detect the ball, thanks to their excellent motion detectors. The fact that human knowledge of dog’s color vision has extended from black and white to yellow and blue is, as a matter of fact, of a great value. After all, it is said that dog is man’s best friend and, as friends go, dogs are a great help. They’re the eyes and ears, the great detectors, the brave saviors and the fearless defenders of the human kind. They are helpful and loving by nature, but most of these important traits are installed into them by dedicated training. Knowing what colors canines can and can’t see is highly helpful while training the pups for their future purposes. Why Do Colors Matter for Dogs? It is a fact that colors matter for dogs. It might not be as clear at first but becomes obvious once you stop and think about it. Take for instance such an occasion as dog sport; besides brightening and livening up the atmosphere of the event, colors have the ability to make the sport safer, minimalizing risks for the dogs. Some sports, agility, for example, are all about speed and reaction. The dogs run with great velocity and only glance at their handler to pick up cues. It is very helpful if the handler is wearing high visibility colors, such that will stand out and allow the dogs to see them clearly. This, of course, will also help the dogs to identify the cues with greater speed and precision. It is a good idea to come and check the sports space beforehand, to know which color are walls and floor, if it is inside. 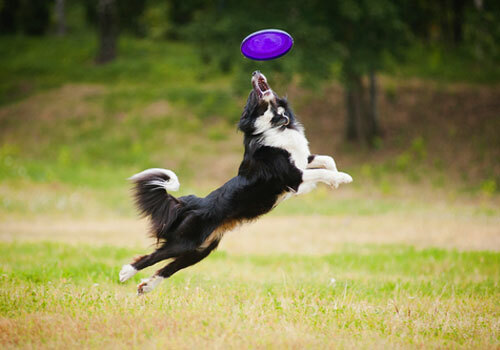 If it is a flyball or flying discs on a grass, make notice of how the surface will be: green or brownish grass, perhaps soil, etc. All those considerations and preliminary checks will help you to decide which color clothing to wear. Strong blue is a good contrasting color for anything yellow, brown or patterned, like advertisements. Black is also a good choice. Pay attention to your shoes too, especially if your dog takes cues from your feet. Some competition venues are considering the fact of dog’s color vision when designing their space, and frankly, it is most wise to do so. There is little sense in erecting a yellow-top table on a brown ground, since the dog might just pass next to it instead of jumping on top of it, and it is nothing to do with their training, they simply don’t see it. Colors matter a lot for dogs. Whether you are merely having fun throwing a brown stick on the autumn brownish grass or participating in a high-end sports event, awareness of your dog’s visual abilities and the contrast you will bring into your mutual visual space will make all the difference from the fun point of view as well as safety. There are many different things to learn about dog’s color blindness and a lot of questions arise when you read more about it. But some of the questions seem to be the most essential ones because I get them asked again and again. Here I have listed all those questions and shall help you to find the answer to your question more quickly. 1. 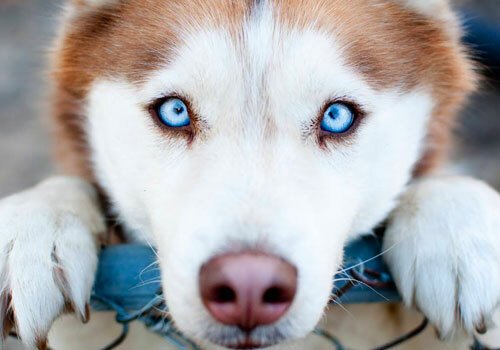 Are Dogs Color Blind? Can Dogs See Colors Like We Can? Yes, they are. Dogs have only two ‘cones’ in their retina, which means they can only see yellow and blue scale of colors, similar to some people who have faulty trichromatic vision. Previously it was believed that dogs are fully color blind and able to see only black and white. Now, after researches of the past few years, it is known that dogs can see much more than that. 2. 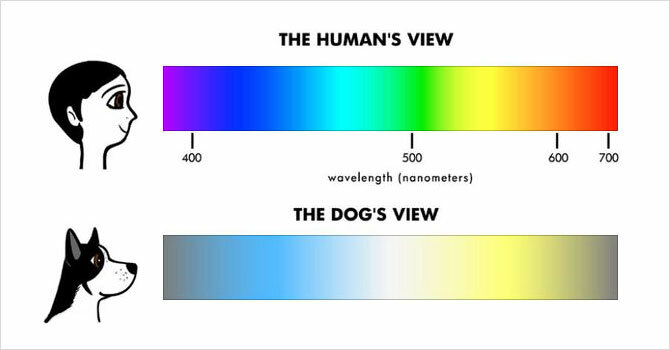 How Do Dogs See Color? 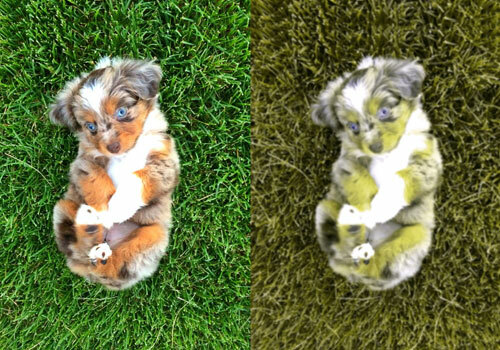 Dogs see color as humans with red-green color blindness do. They see anything on a scale of yellow and blue, and they have lower than humans’ distinction of brightness. Red will appear brown to dogs, pink will show itself as gray and green will turn yellow. Any shade of blue and yellow will be perceived by a dog in its true color. 3. What Colors Do Dogs See Best? Colors that dogs see best are anything on a scale of yellow and blue, and black and white. 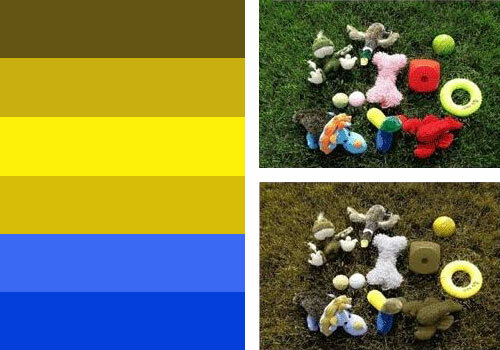 Although it is arguable that the latter two are actual colors, still good to know that our dogs can see them. Colors are seen best by dogs when in contrast; a fact which is important to remember especially when training your pooch for a competition. 4. What Colors Can Dogs Not See? The colors that dogs cannot see are these of red and green scale. Green grass, red clothes, etc. will all appear less or more grayish or somewhere closer to their yellow and blue counterparts. Roses, for example, might appear as yellow and violets as blue. Not being able to see the colors doesn’t mean not seeing the objects but merely not being able to distinguish between those objects based solely on their color. 5. How Many Colors Can a Dog See? 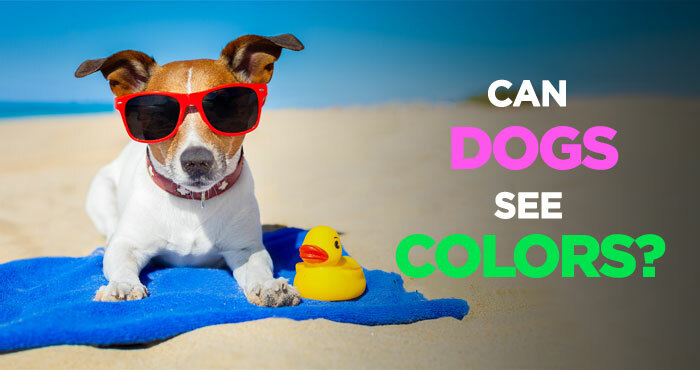 Generally speaking, there are only two major colors visible to dogs: blue and yellow; but it wouldn’t be a just claim, knowing how many actual hues each of these colors has. Only think about how many shades of blue and yellow are there: over forty of each. Remember this before feeling sorry for your pup for being partially color blind. It is a wide-spread knowledge nowadays that the answer to the question ‘Can dogs see colors?‘ is positive. They can see color and enjoy the world in much more than a simple monochrome vision. They do not live in a colorless old movie, so to say. Although their color experience isn’t as rich as that of humans, they definitely compensate for it by other means. Dogs have excellent motion detectors which allow them to orientate better at night than people. Their sense of smell too is as we all know quite an extraordinary tool. Dogs can see some colors. Anything on a scale of yellow and blue will be visible in its true hue, whereas those of red and green will appear somewhere between yellow and blue or on a gray scale. It is important to remember the fact that dogs can see colors, as well as which colors exactly, when going out to play or especially when training your pooch for a show or a competition. Dogs perform multiple tasks for people, helping them in many various ways. We, humans, will do well remembering facts about our furry companions to help them navigate better in this world full of objects and colors.